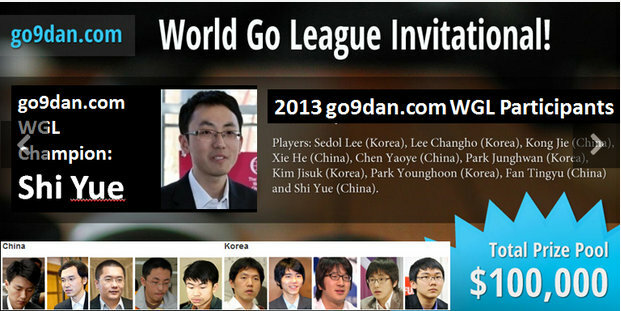 Chinese pro Shi Yue has won first prize in go9dan.com’s first professional World Go League. “I was really happy that I managed to top all these very strong players,” Shi said. The 3-month long World Go League featured ten of the top players in the world competing for $100,000 in prizes, five players each from South Korea and China. From Korea, Lee Changho, Lee Sedol, Park Younghoon, Kim Jisuk and Park Junghwan participated, and from China Shi Yue, Chen Yaoye, Fan Tingyu, Xie He and Kong Jie. Go TV relayed Lee Sedol’s professional commentary on selected games. Shi Yue won with a 7-2 record and Park Junghwan and Chen Yaoye were runners up with 6-3. Ironically go9dan.com co-founder Lee Sedol finished last with a 2-7 record. Click here for complete game results. “Unique to the World Go League, the top 10 superpowers went head to head without any preliminaries,” go9dan.com’s Michael Simon tells the E-Journal. Forty five games among the world’s strongest go players were recorded; for game records click here and look for games marked (P) for professional. All of the games were played online, “which created some very interesting issues,” Simon says. “We saw players run out of time and even place stones on unintended intersections on the board.” When Lee Sedol was doing game commentaries on BadukTV, he talked about his “mouse misses” and specifically about players who are experienced online vs. those who are not experienced. Go9dan.com is a global online go site co-founded by Lee Sedol and former US Champion John J. Lee. It is directly involved in the establishment and planning of projects to foster go. Unexpected network problems and defects in the application took longer to cure than expected so its beta period was extended. Simon says that go9dan.com anticipates launching its full-fledged service very soon.